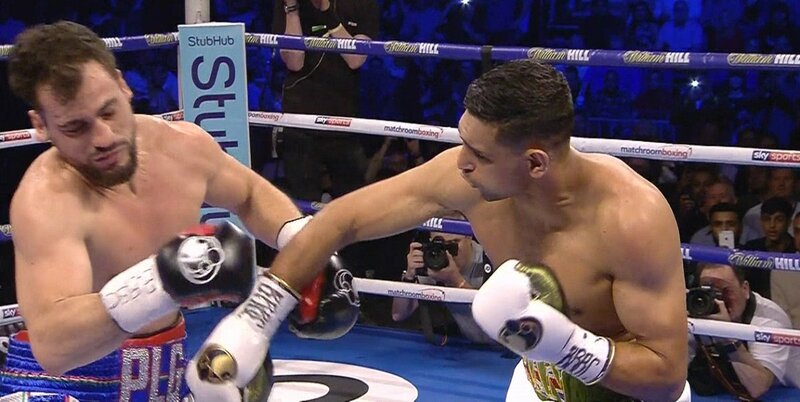 Amir Khan (32-4, 20 KOs) made easy work of his tune-up opponent Phil Lo Greco (28-4, 15 KOs) in stopping him in the 1st round at the 40 second mark on Saturday night in a catch-weight fight at 150 pounds at the Echo Arena in Liverpool, England. Lo Greco was dropped in the opening seconds of the fight with a big left-right combination that he never saw coming. Lo Greco got up off the canvas with a dazed look in his eyes. Moments later, Khan backed Lo Greco up against the ropes with a hard right hand to the head. Khan then unloaded on Lo Greco with a blizzard of shots that put Lo Greco down on the canvas for the knockout. The finishing punch was a left to the head. Referee Victor Loughlin decided he’d seen enough and he stopped it without letting Lo Greco try and get up. Lo Greco probably could have gotten up, but what was the point. He was too slow to be competitive in the fight, and he only would have been knocked down right away. Khan looked very good for what he was facing tonight. This was a slow guy with not much power that Khan was fighting. It’ll be a different story if Khan mixes it up with Kell Brook, who he may be fcing later this year depending on if he wants to take the fight at that point. Khan’s victory might give him some ides that he can face one of the better fighters in the 147 lb. weight class like the winner of the Lucas Matthysse vs. Manny Pacquiao fight. Khan didn’t get faster. It only seemed to be the case because he was facing a slow guy that made him look quicker. If anything, Khan was about as fast as he’d been before. What was different about Khan in this fight was his size. He looked bigger than he had during his other fights at welterweight. Of course, tonight’s fight took place at a catch-weight of 150 lbs. and not at 147. Three lbs. is not that much weight though. Khan looked a lot heavier than what he’d been weighing at when fighting at 147. If Khan can continue to hold this weight for his fights against the top welterweights, he might have a decent chance of besting some of the better fighters. I’m not sure that he can compete with the likes of Errol Spence Jr., Keith Thurman or Shawn Porter though. Those guys might be too good for Khan, but he would have a very good chance of beating Matthysse or Pacquiao. It would be the smart thing for Khan to go after the winner of the July 15 fight between WBA World welterweight champion Matthysse and Pacquiao.